Since 2014, the art world has been finding space for exhibitions about the First World War. This is as it should be. Art has always had commemorative duties when it comes to war. In the days before cameras, before books, before Dan Snow, it was up to art to remember the fighting. From Trajan’s Column, in Rome, to the Alexander Sarcophagus, in Istanbul, from Uccello’s Battle of San Romano to Hogarth’s Calais Gate, the history of art is recurrently a history of conflict. What’s been interesting about the spate of Great War exhibitions is the mixed messaging that has characterised them. Most of them have focused, of course, on the tragedy of it all: the death, the mud. Again, that is as it should be. Right now, there is no more poignant or accusatory sight in any museum in the land than the huge 1919 painting called The Menin Road, by Paul Nash, on show in the Nash exhibition at Tate Britain. What toxic devastation. What lifelessness. What horror. But every war has many sides, and some of the exhibition moments I find myself remembering best from the war shows are memorable for flashes of excitement or swishes of beauty. Christopher Nevinson’s views of arc lights criss-crossing the sky above the western front, included in the Imperial War Museum’s reopening display, had a pulse-quickening rhythm to them, as if the conquest of the dark by electricity remained an exhilarating futurist achievement. Even the poppy installation around the Tower of London in 2014, by Paul Cummins and Tom Piper, was intoxicating in its colour as well as poignant in its messages. 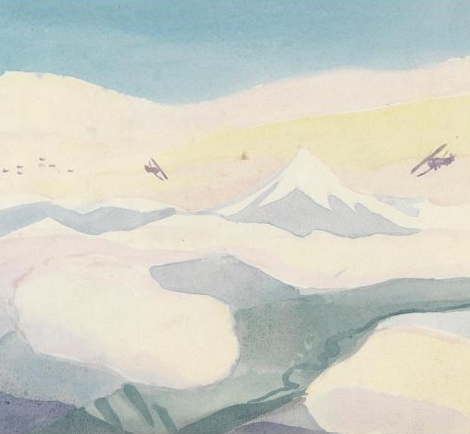 What is to be commended immediately, therefore, about War in the Sunshine, at the Estorick Collection, a look back at the British war effort in Italy in 1917-18, is the unfamiliar gentleness of it all. The good manners. The beauty. Yes, the battle with the Central Powers was as deadly here as it was anywhere else, but even in wartime, Italy is Italy. Not even a deadly struggle against the Kaiser’s men could blot out its ancient charms. 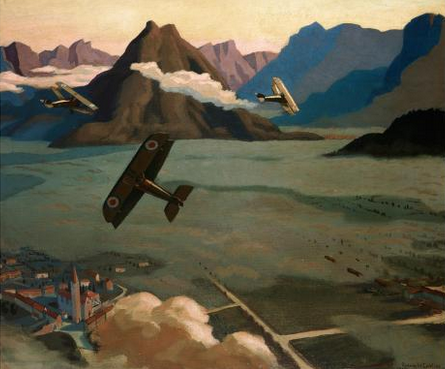 How Britain came to be involved in the battle for the Dolomites is something we will return to. First, a brief aside about the Estorick Collection. What an idiosyncratic institution this is. Devoted to Italian art and Italian issues, located in a sweet but unspectacular townhouse in north London, this curious place should probably be seen as one of the small museums filled with treasures in which London is so unfairly rich. File it, perhaps, next to the Wallace Collection, the Courtauld Gallery, Kenwood House. Where it differs is in the eccentricity of its holdings. Where most such collections are devoted to international Old Masters, the Estorick is devoted to Italian modernism. To Balla, Boccioni, Russolo. To Modigliani, Carra, de Chirico. Collected in the 1950s and 1960s by Eric Estorick, a sociologist turned art dealer, the art gathered here is extraordinarily specific. It’s the finest collection of Italian futurism in Britain, and perhaps the finest in Europe. And, as there is a lot of it, cramming it into a charming Georgian townhouse in Islington has never been easy. At the Estorick Collection, a litre of Barolo is trying to fit into a prosecco glass. In an effort to relieve this tightness, the gallery has just emerged from a dainty rebuild that has added a bit of space, knocked down some walls and opened up some windows. It’s a brighter place than it used to be, less Georgian, more contemporary, and the extra illumination adds a dose of lumens to War in the Sunshine. War historians will be aware already of the British involvement in Italy in 1917-18, but for the rest of us, it may come as a surprise. So fiercely is the First World War defined by the mud, gas and trenches of Flanders, events in the beautiful Dolomites feel irrelevant. But they weren’t. More than 200,000 British and allied troops were sent to northern Italy in 1917 to help the Italians in their fight against the invading Austrians. This British intervention was many things, but — as the photographs included in War in the Sunshine make touchingly clear — what it was most tangibly was the first exposure of the British working classes to the charms of Italy. What had previously been the preserve of the rich grand tourist became, briefly, something an ordinary bloke from Manchester or Wolverhampton or Eastleigh could enjoy. Taken by the official war photographers William Brunell and Ernest Brooks, the pictures of the Italian campaign are unexpectedly smiley and flirtatious. In particular, the visiting English soldiers appear to enjoy the populous presence in the campagna of beautiful Italian peasant girls left behind by their warring menfolk. A squaddie hops up onto a donkey and poses like the equestrian Marcus Aurelius on the Capitoline Hill before a dark-eyed beauty leaning against her cottage door. In an especially memorable moment, a troop of Royal Engineers come to an abrupt halt before three Italian women with spades, who have stopped their road-building to pose for Brooks. The women stare at the camera. The soldiers stare at the girls. Even in war, the attractions of the other are unavoidable. 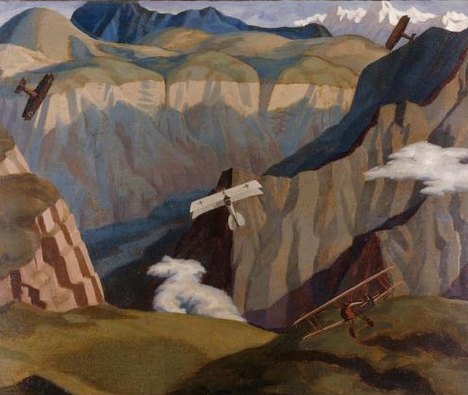 While the photography in the show plucks the Great War out of the mythic blackness in which it is usually dipped and makes it a human story again, the paintings by Sydney Carline also included here offer a thrilling glimpse of the magnificent landscape across which the Italian war was fought. Northern Italy, where it blurs into Austria, is a land of spectacular valleys, soaring mountains and crystal-clear lakes. If you’ve holidayed there, you’ll know how preposterously gorgeous it is. Fighting a war in the mud flats of Flanders is one thing. Trying to fight a war in the Alpine heaven of Lake Garda is another. Carline, who studied at the Slade School of Art and whose sister was married to Stanley Spencer, was unusual in having trained as a fighter pilot. In the Italian campaign, he flew a Sopwith Camel — a plane “so tricky to fly that it killed at least 350 trainee RFC pilots in 1917 alone”. But in the right hands, the Sopwith was the peregrine falcon of early military aviation, and Carline was notably skilled at manoeuvring it. While up there, between missions, he would draw what he saw below. And it is these extraordinary soaring views, looking down on the valleys, summits and villages, that are his most memorable achievement. Being this high up, looking that far down, is an unusual viewpoint in art. Add the bouncy sense of being in a tiny biplane made of paper and matchsticks, which Carline’s art also conveys, and you have a set of bird’s-eye views that had me reaching for the wall to steady myself. Blimey, these are vertiginous. All in all, a charming and eye-opening show. The First World War is a gift that keeps on giving. Who would have thought it?